Chandler, Gilbert, Mesa and San Tan Valley communities. What is the appeal of Active Adult Lifestyle? Residents who are attracted to Arizona 55 retirement communities are seeking a carefree, fun lifestyle with activities and things to do, a safe place to live, new friendships and fresh beginnings. But not everyone living there is retired. But they want to have their retirement home when they are ready to retire... later. It would be difficult to find an environment like the one you have in an Arizona Active Adult 55 community that is as well kept, cheerful, respectful, supportive neighbors, a strong sense of community and a quiet and secure environment without having to pay many times more for the same home in a similar high quality neighborhood. Property taxes are 1 - 1.4%, low homeowners insurance rates, and energy-efficient homes help to stretch a fixed income further. Some residents continue working in the area or work out of their home. Others are working in other areas of the country and come to enjoy their second home over the holidays, to play a little golf and warm up and again whenever they can take vacations. But we all want to live in a secure environment with excellent recreational amenities, organized activities and live near other residents with common interests and experiences. It is possible for 40+ buyers to live in one of the AZ 55 retirement communities. By Federal law, no more than 20% of the homes in a retirement community can have the oldest resident living in the home is between the age of 40 and 54. Each retirement community must decide if they want to change their bylaws to allow this and then set up a procedure to ensure community compliance. Contact me to learn more. 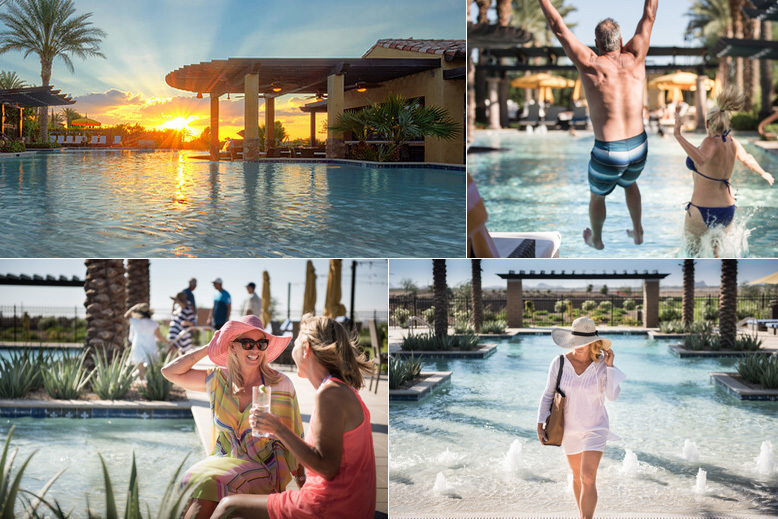 Arizona Golf 55 Retirement Communities -- all about sun, fun & more sun! Some Arizona 55 retirement communities feature housing options that include villas, single-family Gilbert, Chandler, Mesa and Queen Creek AZ homes, and condos. It used to be most 55+ housing was located in the Northwest area of Phoenix near Sun City, the resort that pioneered the concept of golf retirement communities. But Arizona retirement 55 communities are so popular that they are now being built throughout the metropolitan Phoenix area. But don't worry about the children and grandchildren not being able to visit you. The kids will love to visit and enjoy our weather. And grandchildren under 19 years of age are welcome to visit you for up to 30 days a year in many AZ Active Adult 55+ retirement communities. And Active Adult families with young adults 19 years of age and older are welcome to permanently reside in many Arizona Active Adult 55 retirement communities, providing one of the occupants residing within the same dwelling is age compliant. Boomers can take advantage of the current pause in Arizona housing appreciation and buy at a discount with plenty of choices of active adult new homes to choose from. Those Boomers still working and planning to retire within the next 5 to 10 years should buy a home in an Arizona active adult community now and consider renting their home to "snowbirds" here for the winter for the wonderful weather. The rental income will cover a good portion of your housing costs, provide you a place to stay when you want a get-away, allowing you to lock in your retirement home cost at today's low prices and interest rates and give you a second home tax write-off when you need it the most during your most productive years. The (55+ seasonal tenants) "snowbirds" are ideal tenants and take care of your home as their own. It is not unusual for snowbirds to return to stay in the same place year after year - it is almost an annuity. All communities have rental restrictions and Active Adult 55 retirement communities are no exception. Minimum rental lease periods can be as short as 30 days to more than 3 months. I will make sure you know the current restrictions before you buy. No other place offers a minimum of 6 months of absolutely perfect weather and 3 to 4 more months of near ideal weather, as you acclimatize to the dry desert heat. Fortunately, Phoenix has a 75 day summer monsoon season from July to September where heat and humidity are high and we get a lot of rain to keep our Sonoran desert beautifully green. But many even think our monsoon weather is still better weather than they had to face and put up with during the summer in the South, Midwest and Mid-Atlantic states. And we don't have snow, ice, sleet, lightning, hail, tornadoes, hurricanes, earthquakes, floods and other fun weather events to worry about. And the dry, sunny desert bakes out a lot of aches and pains. A Great Place to Play and Call Home! There is no better place to enjoy the best years of your life. Arizona 55 retirement communities offer security, things to do, new friends to make and enjoy and a beautiful community environment. 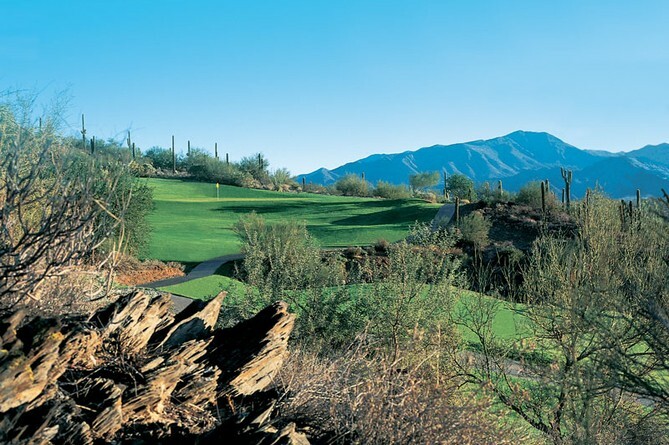 Many Arizona Active Adult 55 retirement communities have a beautiful golf course like this one. What better way to enjoy the near-perfect weather and breathtaking vistas? Builders have done doing studies and found only 34% of the homeowners who live on the golf course actually play golf. They are buying the higher golf course lots because of the like the open feeling. You will see more homes built backing to greenbelts and desert areas. Homeowners living on these desert and greenbelt areas will have the same feeling of openness achieved with lower development and maintenance costs. The Sky is the Limit for Things To Do - including Sky Diving in Eloy! 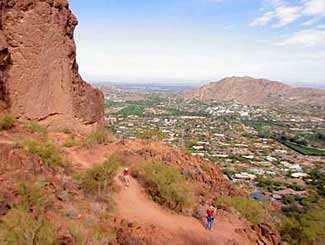 How's this for a great place to backpack close to downtown Phoenix in Paradise Valley? Maybe your idea of exercise might be something less demanding like the weekly evening "Art Walk" in Old Town Scottsdale. There are fun things to do for everyone here. Summertime is always the best time to buy. Most buyers won't return until the winter season begins. Sellers know they have to price their homes right to attract the few buyers in the market. In the winter there will be more buyers to compete for the available properties and sellers can price their homes higher to see what the market will bear. Of course, we have more homes to choose from during the winter season - it's a trade-off. Arizona 55 retirement communities homes for sale are located in Chandler, Gilbert, Mesa, Queen Creek, San Tan Valley, Sun Lakes and Maricopa AZ. Contact Sam to have him help you explore Arizona Active Adult Lifestyle - current home prices, interest rates, and desirable new homes and resale homes available in preferred Arizona Active Adult, Gated, Golf 55 Retirement Communities. This will be one of your best decisions you have ever made and you will enjoy living here. You have worked hard and you deserve the best. So what are you waiting for? There will never be a better time to buy! And don't forget to have your friends about Sam so he can help them move here to be near you!